Hands up if you’ve done the good ol’ day trip to the Blue Mountains before? Thought so. For fresh mountain air that’s only a 90-minute drive from Sydney, you’d be foolish to not have made the trip to our mountainous cousins. Buuuut...we’re gonna break it to you, The Mountains are huge. 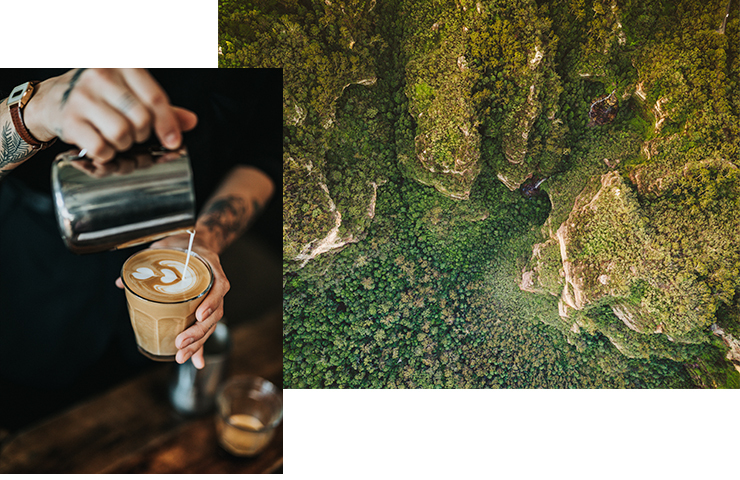 We mean, there’s a whole lower mountains vs upper mountains debate that rivals the Sydney vs Melbourne debate (probably), and in addition to the A-plus views, scenery and hikes, there are excellent eateries and drinkeries...and hello, day spas. There’s lots to love about the Blue Mountains, down from Glenbrook to all the way up past Lithgow. Sorry, but a day trip ain’t gonna cut it. You’ll just have to take a few days to explore the Blue Mountains, k? See you there. 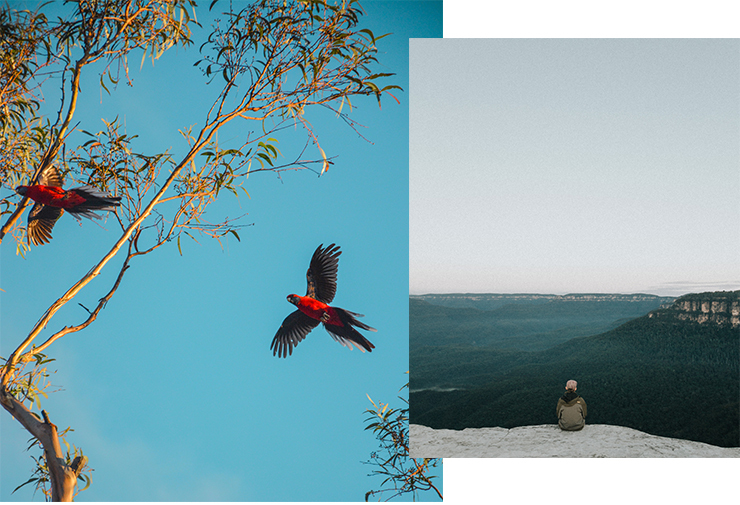 Prepare yourself for the only itinerary you're going to need for a trip to the Blue Mountains. We've teamed up with locals—aka the people have the answers to all of the best things to do off the hidden path—Destination New South Wales, to bring you this epic guide. In case you need even more inspo, you can find it right here. For some of the best coffee this side of the mountains just keep your eyes peeled for the black and white COFFEE sign. Here, they use Reuben Hills beans for their house blend and showcase different roasters for their single origin and retail offerings. If you’re hungry, never fear. Their menu is kick-arse, with a delicious menu ranging from bibimbap and bircher muesli to waffles with fried chicken. Repeat: fried chicken and waffles. You can even request it as a side for breakfast. You gotta check this out—that’s an order. Once you’ve fuelled up, walk it off. Bushwalks are excellent for the waist and great for the hip-pocket (nature is free!). Forty minutes down the highway from Kickaboom, you’ll hit Leura Cascades, a popular starting point for a lot of bushwalks in the area. After taking in the towering eucalyptus trees at the picnic spot, follow the creek for an easy post-brekky stroll. You’ll be handsomely rewarded with views of the top of Bridal Veil Falls. If you’re keen for a longer walk, take the Prince Henry Cliff route. The entire walk takes about 3-4 hours one way, but you can always stop part-way at the Echo Point Lookout for stunning views of the Three Sisters, and then turn back. Good things come in threes, and Three Sisters dishes up the goods big time. This unique rock formation is the beating heart of the Blue Mountains, with the tallest “sister” measuring 922 metres tall. The Three Sisters Walk is perfect for families—it’s a short ‘n’ easy route to the Oreades and Lady Game lookouts. More experienced walkers may want to hit up the Dardanelles Pass if you want to conquer some steep climbs (and as above, the Prince Henry Cliff walk is excellent too). Million dollar views for zero dollars. There’s a reason Leura Garage consistently tops the Blue Mountains 'must visit' lists. The former mechanic-turned-restaurant pumps out amazing food, drinks and good times every day of the week. Their seasonal menu is phenomenal: in autumn, we’re talking hearty steak sandwiches for lunch, mixed mushroom pappardelle for dinner, huge main meals to share (hello, paella) and all-day pizzas. For the indecisive, let the banquet menus do the talking, while you do the eating. To top it off, Leura Garage takes their sustainability seriously. Ingredients are sourced within a 100-mile radius of the restaurant, and their eco-friendly building design includes solar power, energy-efficient lighting and rainwater supply. Can they stop being so fabulous already? Bushwalks and massages go hand-in-hand, so get pampered at Katoomba’s Lilian Fels Resort & Spa. After a morning coffee at Cassiopeia, head to the gorgeous homestead for any one of their luxe day spa treatments, including restorative massages, deep-clean facials, and epic two-hour spa packages (if you’re not sure what volcanic stone therapy is, there’s only one way to find out). Up for a plush getaway? Their boutique accommodation will tick all the boxes—the most deluxe rooms have superb views of Jamison Valley. Winning the title for “cutest art gallery name”, Lost Bear Gallery showcases an eclectic mix of works from established and emerging artists. The gallery-proper on Lurline Street is open on weekends to the public and features a changing roster of contemporary exhibitions (and a permanent bear sculpture out front). The smaller gallery on Katoomba Street features works for sale by represented artists and a monthly curated exhibition. It’s open e’rry day for your art fix. TLC be damned, we’re gonna go chasing waterfalls. 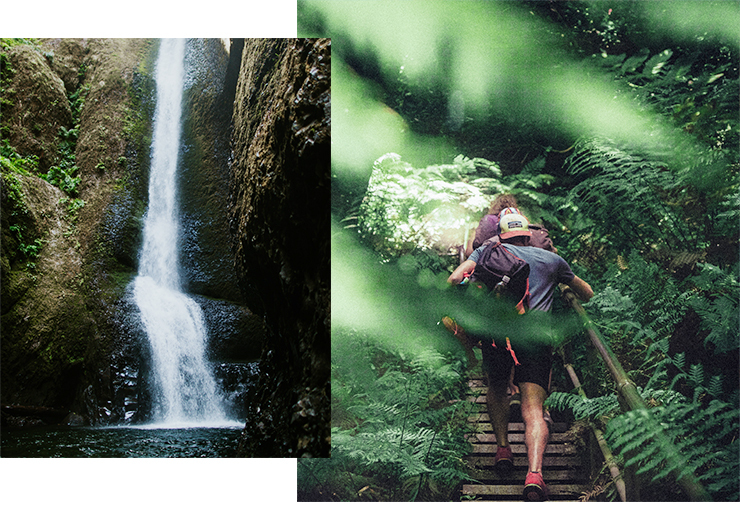 The Grand Canyon Track winds down into lush bush territory, with excellent waterfall spotting to boot (including the beautiful Beauchamp Falls). Not-to-miss highlights include the view from Evans Lookout and the carved rock face Rotunda. For a three to four-hour round trek, it’s relatively approachable. Sure, there are some gnarly stair climbs, but most of the walk is undercover and next to a running creek, meaning: you’ll be cool as a cucumber. PS we’re down for spontaneity, but packing water and sunscreen is a must for this one! Where there’s smoke, there’s a wood-fired oven, and a hot-to-trot Mod Oz menu: that’s the bizz at Fumo (Italian for smoke). Head Chef Joe Campbell does the Asian-influenced, modern Australian food with aplomb. The menu changes with the seasons, but if you’re lucky they’ll have the sake-steamed mussels with kimchi butter and shiso for starters; turmeric-marinated ocean trout with fragrant curry leaves and smoky eggplant for mains, and a saffron panna cotta to finish. They’re only open Fridays to Sundays for lunch and dinner, so make sure you book ahead for this Blackheath gem. Over 28 hectares, The Blue Mountains Botanic Garden hosts 21,000 cool climate plants and panoramic views of the Greater Blue Mountains, and we’re not complaining. Wander at leisure, take a volunteer-led walking tour (check the what’s on calendar) or hop on a 20-minute shuttle bus tour. There’s even a garden shop onsite, featuring exotic or rare plants that have been successfully propagated and are available for sale (because plant souvenirs are the best souvenirs). The Glow Worm Tunnel makes for an ethereal sight: in a once-abandoned railway tunnel glitters thousands of glow worms, letting off their ghostly light. It’s an other-worldly experience that you won’t forget. You’ll need to tread carefully and quietly through the dark, 400-metre tunnel, and be careful where you shine your BYO torch—the glow-in-the-dark larvae are sensitive to noise and light. The Glow Worm Tunnel is part of the heritage-listed Wollemi National Park, which is a whole mini-universe of rivers, forests, canyons and bushwalks. For next-level glamping, book yourself into a Bubble Tent. It's literally a bubble—a clear, dome-shaped shelter overlooking Capertee Valley, the world’s second largest canyon. Translation? Prepare yourself for some unforgettable views and star-gazing. Stock up on groceries in nearby Lithgow, and settle in for an unforgettable night. There are only three tents available for accommodation hire, and they’re well tucked away from the main road for max seclusion and privacy. So, what are you waiting for? Get in the car and drive. For more things to do in the Blue Mountains, check out the Destination NSW website. Image credit: via Bubble Tents. Editor's note: this article was produced in partnership with Destination New South Wales. Thank you for supporting the partners who make The Urban List possible. To read our editorial policy, click here.